If you need a wiring diagram... The soldering part will be way over your head. with refrence to the thread 31st July the op used 32 guage as a temp fix to get it started and still ended up sending it in. sorry but no, sorry mate, no disrespect or anything but,, for the simple reasons, my initial response to the thread was as a get out of jail fix assuming you where just going to get on with it knowing how to go about it. im now feeling like ive got to put my name to it, with you using my drawing as a refrence if something goes wrong, you still haven't established why the fuse blew. my answer would be 25amp fuse wire. and how is anybody going to know if it will still work the fuse would have blew for a reason. thank you...I think your very right .. Thank You for referring this diagram. It would be very useful for the DIY folk specially. I believe that there is no (+) Positive & (-) Negative of the fuse. I am going to install this......... i will confirm if it works or not. 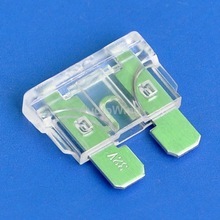 Car Medium Blade ATO Fuses. Quantity: a lot of 2 pieces. have you not tried your local fuel station for a fuss,? what is the mod or do you have a photo? best of luck to yah, and don't forget to fully tape it up, insulate it.. Personally I would put a lower fuse on like 20 A because these will take longer to blow than the SMD ones, if you can find "fast blow" they would be best. But you have to understand that this is a your own risk, you could send the board to Evolv and get them to check it and replace the fuse. Please tell me if you are confident with the installation of automotive fuse, or not? because i have satisfied with your reply to this post. I prefers to install an automotive fuse because it (fuse blow) has been happen to my second device. I live in Pakistan and it takes more than 2 months for shipping and return from Evolv, due to the reason i am searching an alternate for changing the fuse. ebay and other vendors but they do not ship to Pakistan, therefore, i am searching for a good and authentic alternate. if there is someone who already have tried it and satisfied with its working, his opinion / experience would be very helpful for me as well as for others.
" If you are feeling feisty, you could short across the fuse on the board with a large wire and install a mini 25 amp automotive fuse in line with the battery if you have space in your device." What i understand, the Jhon's suggestion is absolutely according to the "wiring diagram" referred by you. Yes what John described is the same as the picture I did for you. Thanks a lot...... Now i am going to install the fuse with a hope that the board will work as work with the SMT fuse. I have short the fuse points and install an 25amp automotive fuse according to the diagram. Oled become on but when i attached the tank/atomizer and press the power button an error is displaying i.e, "Check Battery". When i plugged the charger, it does not charge the battery. (1) Escribe Battery Status (2) Board plugged with charger but not charging the battery. now i cant understand what is the problem? Please Guide.